Buddy and Cindy were married in 1968 and lived in Fairbanks Alaska for two years while Buddy completed a tour in the Army. Upon returning to Jacksonville Buddy took a job in his field working for a metallurgical engineering firm. In 1971 Kenneth Archibald, Cindy's' father asked him if he would like to learn the boat business (literally from the ground up). He accepted. With the drive to learn about boat building he worked for several years on the plant floor to learn the art of boat building. Eventually having carpentry, paint and mechanical under his belt he moved to inventory control. In the mid-70s management determined a need for a separate and expand the service department. Buddy was offered the position and built the service business to represent 40% of the total business. 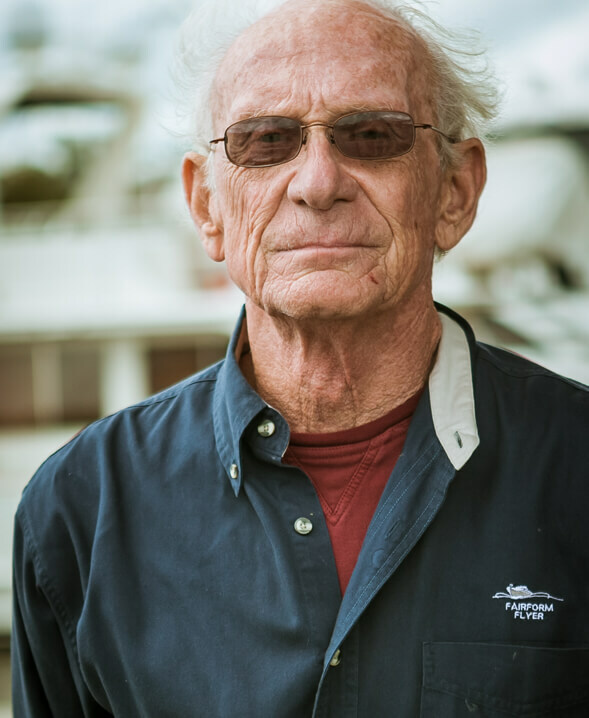 During his time in the yard he has been a part of many Huckins firsts, to include; being involved in the transition from cold molded construction to fiberglass composite construction, building a 50 footer with four outboard motors, powering a 78 footer with Arneson drives, and the largest yacht in the word with Arnesons at the time. In the early 80s he became president of Huckins and continues to lead the company. Buddy will never get tired of talking boats or thinking up new innovative ideas. Please direct your service and parts questions to the expert.